Anderson Company Video | Anderson Hay & Grain Co., Inc.
Hi, I’m Mark Anderson, CEO and President of Anderson Hay & Grain, a company founded in 1960’s by my father and grandfather. The key part of our success is sticking to our original roots of agriculture and farming families and meeting the needs of livestock producers, really whether it’s across the street or halfway around the world. We understand that our success, no matter how large we get as an organization is about continuing the needs of agricultural families in our country as well as agricultural families and livestock owners halfway around the world and keeping to those roots and those values is a very key part of our success today and a feel for the years to come. The single most important value in this organization is our relationships. This organization was founded on relationships with our growers, with our employees and with our customers. And I think as we do business, staying focused on those really helps direct us to make good decisions in a deep supply base having those relationships in the countryside and the support from the countryside and having them really recognize what the marketplace needs really is a key component to us delivering to our customers; and obviously on the employee front the synergies and the chemistry and the team work that takes place in this organization is truly what allows us to deliver to all of our business partners and to each other as an organization. As I walk through this field you can see the high quality of this forage product. Most all of our supply comes from commercial forage fields where there is a good rotation of other crops that keeps the soil at its highest quality which allows a stand of alfalfa to look like this one, no weeds, free of foreign material, specifically being grown for an international marketplace that’s very very meticulous about the product that it buys. A very important part of raising a high quality forage product is a good abundance supply of water as a natural resource. In this day in ages agriculture works harder and harder to manage this precious natural resource, but the technology in irrigation equipment has gone to great levels where computerized circle equipment, like some which are seen here, spread the water very evenly, very consistently and allows us to take care of the precious resource. Well a big part of a high quality forage product is the proper growing and watering and soil management being done right. Harvesting the product is crucial to ending up with an end product that works for the customer. As we go in and look at harvesting, weather conditions are vital for natural encuring the product out after cutting. And then having the right amount of baling and harvesting equipment to go in and bale it timely to end up with a product that stores well that’s ready to ship. 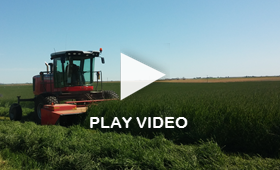 The hay business takes a huge investment to in equipment to harvest timely and accurately they end up with a product that works for the customer. A very very important element to the business is storage. We store our hay and straw products in two different ways. One is the fully wrapped covered stack, and the other method of storage is buildings, large storage warehouses, and again when you put the product in there and as much as a year later we can be going into those buildings and the product is green and dry and clean and has been kept away from the weather conditions that would create any kind of damage. One of our main products handled at our Oregon division is straw. The difference of straw is and hay is that the straw is after a seed harvest has taken place, and in the case of our Oregon plant which is located in the heart of the Willamette Valley, which is one of the biggest grass-seed producing areas in the world. We go in after the seed growers harvest the seed crop, we go in and rake and bale and stack the straw product. Years ago all of that straw was burned and over time many of us in this industry worked on markets both domestic and international markets to go in and be able to go in and bale that product, store that product and keep it from being burned. It’s a great solution not only for the seed industry but for the environment in general, and obviously it provides a low priced roughage product for both the international and domestic market place. After the farming and storing part of our business, the next most important element is taking that stored product that is out in the countryside and moving it all the way through our facilities into containers for international shipment. As we bring the hay in we keep very close traceability to what field and what stack numbers come in the plant and put the product into our facility in preparation for orders. We don’t have any large storage of finished goods, everything is stored in the plant and loaded directly into containers is a return from the port. The administration functions within the organization are critical especially when servicing an international marketplace. We work very hard to get together with customers; we have daily communication with customers, email, phone, sometimes in person, where were putting together the business, putting together the orders, making sure that things are dispatched properly on the trucking and logistics side, plant dispatching all of the deliveries back to the port, and then the international documentation and accounting that takes place to put together final documents for an international marketplace. An important part of our business is port infrastructure, our location to port facilities and the viabilities of those ports where we ship out of. Imports and active imports are a key part of being a successful exporter, we have to have good container availability, good ship availability, and have those carriers going to the countries that we are trying to ship to. That trade and that trade infrastructure is extremely important for us to meet customers needs timely and competitively. The single most important value in this organization is our relationships. This organization was founded on relationships with our growers, with our employees and with our customers, and I think as we do business staying focused on those really helps direct us to make good decisions and the decisions that have allowed us to be successful for generations.